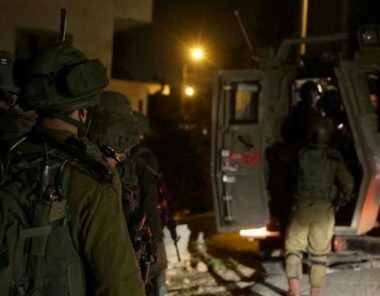 Israeli soldiers abducted, on Thursday at dawn, five Palestinians, including former political prisoners, from Bethlehem governorate, south of Jerusalem in the occupied West Bank. The Bethlehem office of the Palestinian Prisoners’ Society (PPS) said several army jeeps invaded Nahhalin town, west of the city, and abducted Fares Hasan Fannoun, in front of his home. It added that the soldiers also invaded the Saff Street, in Bethlehem city, searched homes and abducted Ismael Mohammad al-Battat. Furthermore, several army jeeps invaded Beit Fajjar town, south of Bethlehem, searched homes and abducted three former political prisoners, identified as Jawad Mahmoud Taqatqa, Raed Mohammad Taqatqa and Ahmad Mohammad Taqatqa.